Joy, one of our local artists just restocked us with some new beaded wire wrap bracelets. 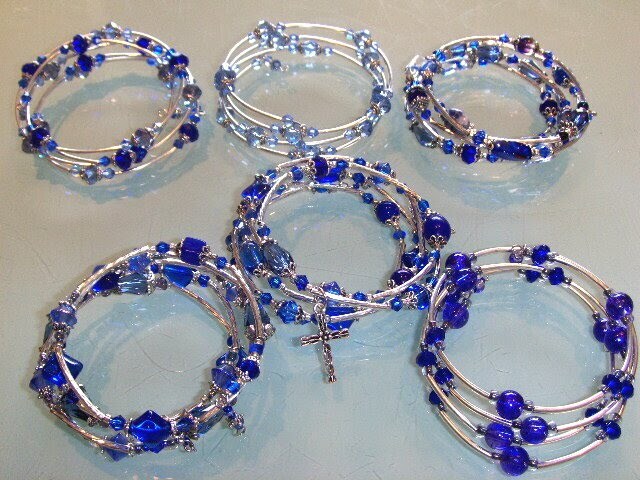 How beautiful are these blue and silver bracelets? They are perfect for showing off your Orlando Magic Spirit! We're all proud of our LOCAL Orlando team, the Magic, so let's show it off with style from a LOCAL artist! 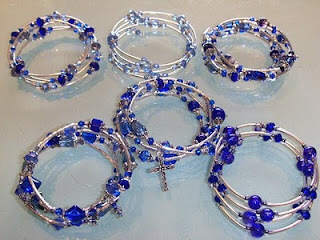 Along with these gorgeous blue and silver bracelets, Joy stocked us up with a bunch of her new silver bead line. Red, turquoise, aqua, greens, black, orange, I have it all! Many of them have matching necklaces! Don't worry we have plenty of Joy's traditional stock as well in a boatload of different colors and the pricing is still only $15.99 or 3 for $30. We also added a bunch of $10 necklaces! Stop in the Orlando store for your local artist fix! We just got our new shipment of khussa Indian shoes in. That means my looooong list of brides can get their wedding shoes! Yay!!!!! Cool white shoes, warm white shoes, and off white/ivory flats are finally here in sizes 6-12. This time we got a nice neutral white for the warm white so it's easy to match with dresses. Most of our shoes are silk and can be dyed to another color or tinted another shade of white. You don't need, nor really want, a perfect match to your wedding dress. The style is heavily trending towards shoes that are a few shades different or an entirely different color. Think elegant beaded gold flats with an ivory wedding gown or delicate silver flat wedding shoes with a pure white gown. your wedding shoes can be your "something blue"! Remember khussa shoes have no left and right foot when they are new. You custom create your own left and right by breaking them in. Wet your feet, slip on your wedding flats, and wear them around the house for an hour or so. The more you wear them the more comfortable they become. Gorgeous shoes, that are custom formed to the shape of your foot for your wedding? What more could you want? How about less than 24 of each style is made so they are are very exclusive too! One more thing...they cost LESS than $40!!!!! That's a wedding bill I can get down with! The white wedding flats will sell our QUICKLY, so get your size as soon as you decide. Shop for beaded wedding flats here. 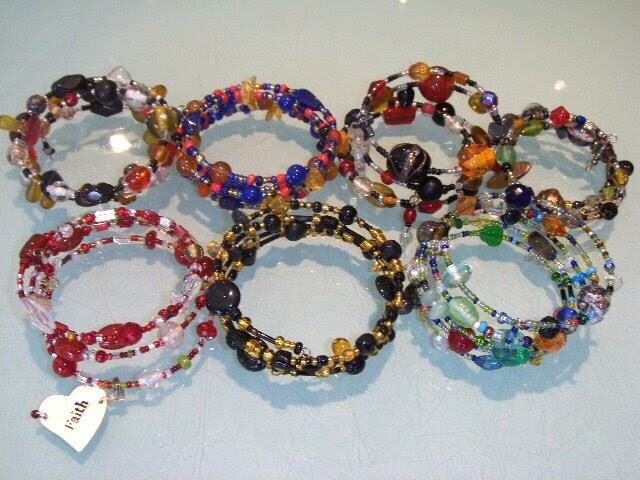 Need some tips to put on glass bangles safely? Follow our handy video! Remember stay loose and flexible ~don't tighten up!~ and use lotion. There are 3 sizes available, so be sure to select the proper size for yourself. Find more information about traditional Indian glass bangles at our bangle help site, www.ShopBangles.com. You can learn to find your size in glass bangles, learn about Indian bangle history, glass bangle trends, and more fun stuff! The best glass bangle shopping is always available at www.ShopBeachcombers.com. 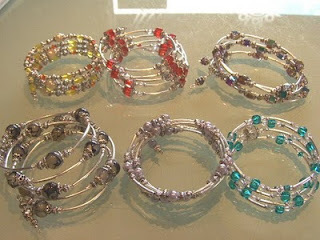 Bangles for the all of us! Henna Tattoo Safety: No Black Henna! It's summer time and that means henna tattoos! ...at the beach, on vacation, at festivals, everywhere! Let's talk about henna safety. You may have heard about people with allergic reactions, burns, and/or scars from a henna tattoo. Those are not from pure natural henna. Those misfortunes come from so-called "black henna". Allergies to natural henna are EXTREMELY rare. Do not allow anyone to put henna on you if the stain is going to be black! The color of natural henna varies and can be a deep burgundy brown, coffee brown, rich maroon-ish, or any shade of orange or brown. The color of your actual henna tattoo will depend on a number of factors including, how fresh the henna is and what it is mixed with, how the skin was prepared before applying the henna, how long the moist henna was in contact with the skin, what part of the body was hennaed, and how the dried henna was removed. Henna needs to stay on a good while (much longer than an hour) for a deep long lasting stain. The length the stain will stay depends on your body chemistry, how long the henna is left on, if a sealant was used, your body temperature, and how well the henna tattoo is cared for. A typical natural henna tattoo will last 5 days to 3 weeks. What color will the henna stain be? If the answer is black or anything other than what is described above, do not allow that substance to be applied to your body and seep into your bloodsteam. May I see a list of your ingredients? Check the list for additives you either don't recognize or that you may be allergic to. How long does the paste need to stay on the skin. If the answer is less than an hour, there is likely and additive in the henna that shouldn't be there. There are many real henna artists around. Find a reputable artist that mixes their own henna and get a henna tattoo from them. You will be safe, you will get a better quality henna tattoo, and you will enjoy it more! If you are local to Orlando check out list of local Orlando Henna Artists here. You can also do your own henna using a complete henna starter kit geared towards beginners. If you just want henna to do a couple of times try a fun & easy henna kit for less than $15. Heck even with shipping it's less than $20! Have fun this summer! Get many henna tattoos! Be SAFE!